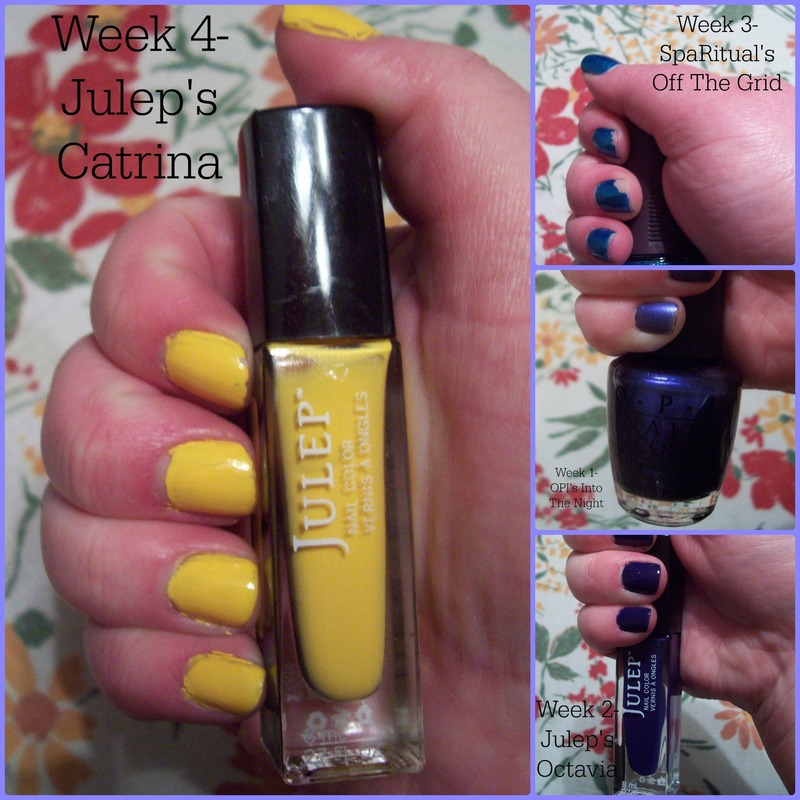 Yet again, I opted out of the Julep Maven box for January (but I did get February’s box!). Instead, I have pictures of the polish I’ve worn for the last month, since one of my goals for the year is to wear a different color every week, with no repeats allowed. I really liked the SpaRitual one, and it makes me think of oceans and mermaids and (randomly) Elsa from Frozen. I did notice it was thin, and needed 2 coats for more even coverage, but overall, I think it might be my favorite I’ve worn this month. But Octavia and Into The Night are pretty. And I used a matte top coat for Into The Night- although I wished I had thought of at least one nail just on its own, but it’s basically what you see in the picture but not matte. As for Catrina…I didn’t really like it. I mean, yellow is an awesome color, but this shade didn’t work for me. I think I’m much too pale to wear it. I also need to take pictures same day or within a day or two of doing my nails. Clearly, there were a couple weeks when I was feeling too lazy to take a picture, given there were some chipped nails. But perfectly polished nails can be over-rated. Let’s be real, with the cooking and hand-washing I do throughout the day, my nails get chipped. 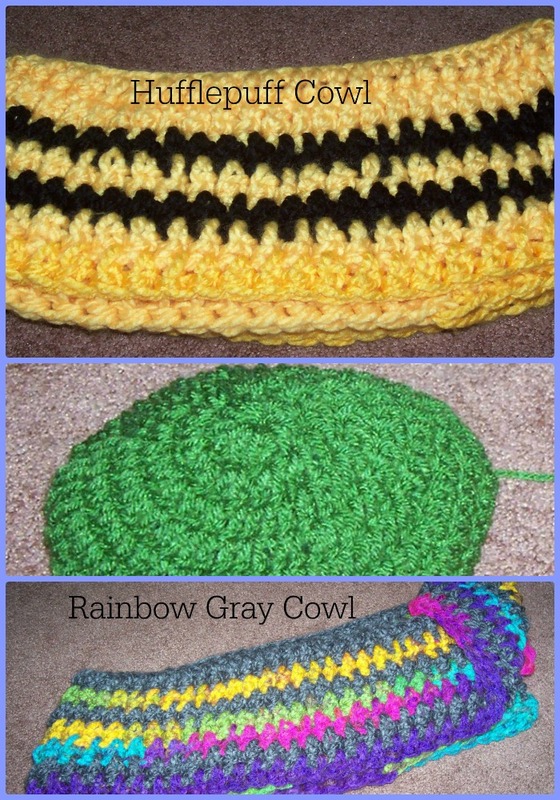 I’ve been crocheting up a storm! Remember that super-secret project I was working on? I can talk about it now! I made a baby blanket for my cousin, and it turned out well! Except for the part where I got half done, realized it was super-crooked to the point that nothing would make it more straight, and had to re-do half of it. I am amazed of the magic that borders work, which straightened it out to the point that I think only I would notice. It turned out so well, and I loved the blue. Also: the grey was great, and I’m glad I picked grey instead of the sandstone the pattern recommended. I do wish the white was a brighter white, because I think the blue and grey would stand out more, but the softer white is a cozy baby blanket kind of white. Plus, the white was a pound of white, and the last thing I need is more white yarn. I took a little bit of a crochet break, because I was feeling burnt out after making a baby blanket, but now I’m back to crocheting! I’m doing a ton of smaller projects, because my brain and my hands cannot handle something bigger. So a blanket I started almost a year ago is on hold again. I’ve made a couple of cowls- one in Hufflepuff colors (black and yellow) and a grey/variegated yarn. I like both, but the grey/multi-colored yarn is really pretty! Why is grey + color so awesome? Seriously, it is. I have no idea how I managed to twist the multi-colored- it seemed to happen somewhere in the making of it, and not in the chain. Either way, I love the colors. I also started on a hat for St. Patrick’s Day (which reminds me that I need to start on something for Valentine’s Day), and it’s the unfinished green thing you see in the middle. I’m trying really hard to not buy books, because I have so many books that I haven’t even read yet! It didn’t completely work, because I did get some e-books- California by Edan Lepucki, Grounded by G.P. Ching, Love Is The Drug by Alaya Dawn Johnson and Open Road Summer by Emery Lord, plus I pre-ordered Breaker by Emma Raveling. Still, because I have a tendency to buy books only to not read them, I’ve decided to not buy a ton of books this year. I can’t do a complete book ban, but I definitely want to reserve buying books that I know I am genuinely excited about and know I’ll read right away. Or if I’m going to a book signing. Like in March, when Gail Carriger is doing a book signing here in San Diego! I am super-excited about that. As for audible, I got Jesus Land by Julia Scheeres, and I’ve been interested in reading it ever since I read a book by the same author about Jonestown. I haven’t really watched much t.v. this month. For the most part, I’m randomly watching stuff on Hulu as it comes up, and there’s only a handful of things I’m keeping up with right now. I’ve been watching the currently airing season of Downton Abbey, which I’m so going to have to re-watch, because I’m somewhere in season 2, and I’m sort of confused about what’s going on, and yet I still want to watch it. And I’ve been watching NCIS and Sleepy Hollow and American Horror Story because I know they’re on. I just really dislike the t.v. season once Christmas is over, because it feels like 1 or 2 weeks of new episodes followed by, like, 3 weeks of re-runs. It’s annoying, and makes me not want to watch t.v, since it feels like everything is on at the most random times. So many things! Check out my pinterest board for everything I’ve pinned- although it is annoying when I want to pin something, and can’t because there’s no picture. Thankfully, it’s not often, but I may have to bookmark those and share them. Still, I liked that there’s this guy that took pictures of what people were reading on the subway. *I am definitely not cynical, and while I try to keep it real, I don’t do it to the point of grossing people out…I hope. As for the sarcastic sense of humor, let’s just say that my nickname is Snark Ninja for a reason. Time’s 100 Best YA Novels is a slideshow, as is their 100 Best Children’s Books. (If you want a non-slideshow version, the two links below have it in list form, although if you google it, I’m sure you’d find a list with no problem). I’m generally not critical of these kinds of lists, but these 2 have left me with so many questions and thoughts. Their definition of children’s books seems oddly specific while YA is very vague and broad, and how they apply it is super-inconsistent. Some series get one entry, while other series have multiple entries. Some authors get several books, while others only get one. Basically, I want to know more about the selection process. And one final thing, since my mini-rant is over: an interesting article about how diversity isn’t reflected on the Times’ Best Of YA list, with a focus on how Native Americans are portrayed in some of the books on the list. She also has one for the Children’s list. It’s interesting to think about (especially for me, because it’s not something I’ve HAD to think about). I finally got 1989, which, for those who don’t know, is the new Taylor Swift album. I’m super-late to that album, but I’ve been listening to it on repeat for days. Days, I tell you! I rarely buy full albums for actual artists- usually full albums are soundtracks, but given how much I love Blank Space and Shake It Off…and the tail end of her new single, I knew I had to get it. It’s Taylor Swift, but more subtle. Any song would do well as a single. I have my favorites (Style, Out Of The Woods, Bad Blood and Wildest Dreams) but I honestly can (and have) listened to the entire album over and over and over. And I’m still not sick of it. It really is her best album yet…but if you hate that Taylor Swift has gone pop, and thought she was better when she was country (I know you’re out there), you really need to give it a chance! Other than Taylor Swift, I haven’t really listened to a lot of music. I hate the remix of Hanging Tree that’s randomly been playing on the radio. Can we stop remixing songs just because we can? Because if there’s a song that shouldn’t be remixed, it is that song. I am leaving you with Take Me To Church by Hozier. I so need the entire album, especially if it’s anything like this song.